Water and energy are closely linked. A clean reliable water source consumes energy. Water conservation leads to energy conservation. The clean water that flows out of a faucet needs energy in many stages of processing and transport before it gets to the tap. Depending on the location and quality of source water, be it stream, lake or aquifer, preliminary water treatment measures are often required to meet water quality standards. A system of pipes delivers water to the user, and in many systems, electric pumping is used to deliver the water at the proper level of pressure. Once the water reaches the consumer it may go through a number of energy intensive processes including gas or electric heating. The wastewater that flows away from the home must be transported to a wastewater treatment plant to be treated and released back into the natural water cycle. This also requires energy. The transportation of water is one of the most significant uses of energy in freshwater production. Pumping groundwater to the surface and over land through high elevations are energy intensive processes. 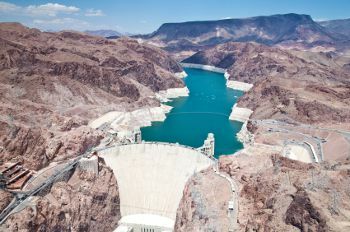 Pumping 17,000 ft3(480 m3) of water a height of 330 ft (100 m) requires approximately 200 kilowatt-hours of electricity (learn more). In many major municipal areas water is pumped hundreds of miles from its source before it is used. In an average home, heating water accounts for 15% of the total household energy use (learn more). Nearly 30% of all indoor water use is hot water. Hot water is used for dishwashing, clothes washing, showers, baths, faucets, hot tubs and cleaning. Running hot water out of a faucet for five minutes is equal to the amount of energy it takes to burn a 60W incandescent bulb for 14 hours. After water goes down the drain it flows into the sewer to be treated at a wastewater treatment plant. 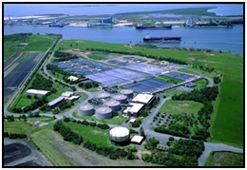 Energy is used in pumping water to the wastewater treatment plant and in treating it with aeration and filtration. For example, in California it takes approximately 475-1,400 kWh of energy to treat 300,000 gallons of waste water (learn more). The energy needed to treat that much water in other states will vary.